Skunk 1 feminized is a wonderfully sweet smelling kind with light lemon candy flavour and a heavy buzz. Skunk 1 is a Sativa dominant plant but doesn't grow in a typical Sativa way, for example she won't get too tall and the leaves are small but also wide, indica influences are definitely noticeable. The buds have a beautiful constant structure, while growing they have a golden green colour all over with resin covering all over the bud. Skunk 1 is a genetically strong plant so it is no surprise lots of other kinds have been developed in addition of these excellent genetics! 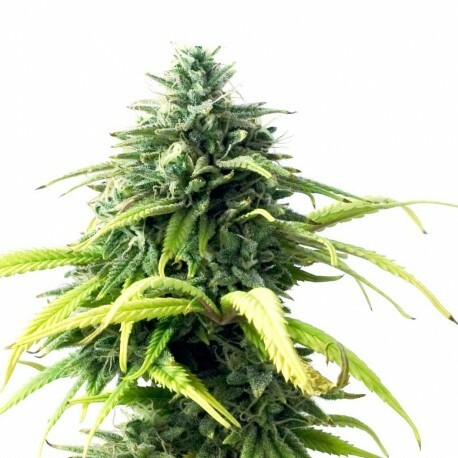 An exceptional high yield is why she is loved by so many breeders as well as users and although her name promises a typical Skunk taste, as soon as you smoke her buds the sweet lemon candy flavour will tell you otherwise. You can call this a genuine sweet surprise. The effect from smoking or consuming Skunk 1 buds is a quick upcoming buzz that keeps you in a couch-lock for a while. The original Skunk 1 seed that changed the cannabis traditions and surprised weed fans for more than three decades is now available in the form of feminized strain. The capability of this variety is so much that it is usually called as powerful ganja. Marijuana growers, cannabis lovers, and breeders consider this as the benchmark of reliable, uniform performance, and rock-solid genotype, which inspired several thousand modern hybrids. The beautiful yields and energetic performance reveal the true meaning and identity of hybrid vigor. Flowering and growth are mostly indica in look; despite it grows above average height than Indica inbred variety while blossoming. Among all marijuana seeds known for offering best smoking pleasure, Skunk 1 stands way above the rest. It has been bred from different genetics of marijuana from Afghan, Mexican, and Columbian strains and produces great result. It is one of the best truly commercial feminized seeds with pest and disease resistant qualities. It usually flowers within 60 days and cultivates well in either organic soil or hydroponic mediums. It is best suited to be grown in soil as it yields better taste. The quality, power, and strength of the strain are very high and Skunk 1 is a general term for cannabis or ganja.